Finite-sample system identification algorithms can be used to build guaranteed confidence regions for unknown model parameters under mild statistical assumptions. It has been shown that in many circumstances these rigorously built regions are comparable in size and shape to those that could be built by resorting to the asymptotic theory. The latter sets are, however, not guaranteed for finite samples and can sometimes lead to misleading results. The general principles behind finite-sample methods make them virtually applicable to a large variety of even nonlinear systems. While these principles are simple enough, a rigorous treatment of the attendant technical issues makes the corresponding theory complex and not easy to access. This is believed to be one of the reasons why these methods have not yet received widespread acceptance by the identification community and this letter is meant to provide an easy access point to finite-sample system identification by presenting the fundamental ideas underlying these methods in a simplified manner. We then review three (classes of) methods that have been proposed so far-1) Leave-out Sign-dominant Correlation Regions (LSCR); 2) Sign-Perturbed Sums (SPS); 3) Perturbed Dataset Methods (PDMs). 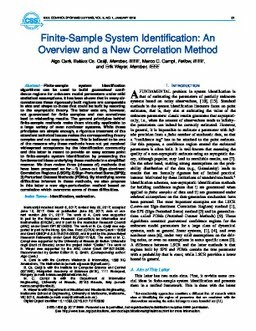 By identifying some difficulties inherent in these methods, we also propose in this letter a new sign-perturbation method based on correlation which overcome some of these difficulties.